Congratulations to Janet K., Anna, and Brenda R., the winners in Karen's giveaway. Thank you all for participating! Although I have written romantic suspense novels set in a great variety of places, I have loved doing eight books set in Amish country. Besides the gorgeous rural scenery and fascinating look at the unique Amish culture, I think the success of these books lies in the fact that the two main romantic leads—who have to solve a deadly crime together—come from different worlds. When an Amish person, usually the woman, falls in love with a “worldly” man, the sparks really fly and the stakes are high. Ah, there is nothing better to spice things up than forbidden love. Why forbidden? Because for an Amish woman to commit to her love for a non-Amish (They call them English) man means she will be an outcast. The Amish reserve shunning for a church member who breaks their rules. Shunning means being exiled from friends and family. The Amish will not even receive a gift from the one who has been shunned. They see this as a way to keep people in their flock by showing them how it feels to be an outcast. Once the person is restored, the Plain People welcome them back with open arms. On the other hand, a worldly person who falls for an Amish person, if they want to marry, must become Amish and shun the world. This means trading a car for a horse and buggy. No more electricity, cell phones—you name it. But as Alex Caldwell discovers in FINDING MERCY, his love for Ella Lantz, an Amish woman, is well worth the price of giving up some of what modern people consider necessities. Besides, there are many benefits of Amish life: strong families and faith, closeness to nature, less stress. 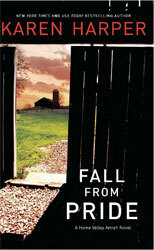 FINDING MERCY is book #3 in THE HOME VALLEY AMISH TRILOGY, although the books can stand alone. (Books #1 and #2 are FALL FROM PRIDE and RETURN TO GRACE. ) In each of these novels, an Amish woman and worldly man are thrown together to solve a crime and stay alive, and that blends ‘romance’ and ‘suspense’ into an exciting book. I think that emotional roller coaster is the result of combining romance and suspense, especially in settings which make the growing love between the hero and heroine forbidden. They can’t help their attraction to each other despite the taboos and dangers—and, hopefully, readers can resist the book which reveals their forbidden love. 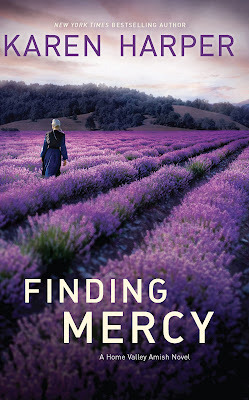 I'm giving away 3 copies of FINDING MERCY for readers of Maureen's great rom/sus website. Giveaway ends 11:59pm EST Nov. 11th. Please supply your email in the post. You may use spaces or full text for security. (ex. jsmith at gmail dot com) If you do not wish to supply your email, or have trouble posting, please email maureen@justromanticsuspense.com with a subject title of JRS GIVEAWAY to be entered in the current giveaway. I love your books in general but especially your Amish books. Dark Harvest is a reread for me actually the whole series. This series is great too. Please keep them coming! Sounds like a good read. I live not two far from two Amish communities in Ohio. It would be facinating read, I think, for a English woman to fall in love with an Amish man. Your books sound intriguing and wonderful. Can't wait to read them! Thank you for sharing a bit of your new romance/suspense novel. I agree that the forbidden aspect puts a special twist on the story. Have not read this series but would love to start. I have a few Amish stories waiting for me in my TBR pile, but none are suspense... This sounds like a very interesting trilogy you have. Thank you for sharing with us today Karen! Happy November! Thanks to reader comments so far. Although I live in Ohio, near a huge Amish settlement, I know a lot of other states have Amish. They have even settled in Texas and Mexico--Canada too. Anyone in states other than Ohio and Pennsylvania, have the Amish near you? I do like the excitement of romantic suspense stories and then you add the forbidden love aspect and this sounds like a fascinating series. Hi Karen - and congrats on the great reviews for FINDING MERCY. I love your Amish work and look forward to reading this latest. Love the cover, too! I have read the first two books in this series and look forward to the last one! I love all of Karen Harper's books. They may have the Amish settings but the plots and stories are just wonderful. I really like when a romantic suspense has emotional moments. It makes me connect better with the characters. This is very appealing! Sounds fantastic! Thanks for the great post and giveaway! Romantic Suspense is one of my favorite genres. I always enjoy reading about the Amish as well. Love romantic suspense and we spend our vacation every summer in Lancaster, Pa.